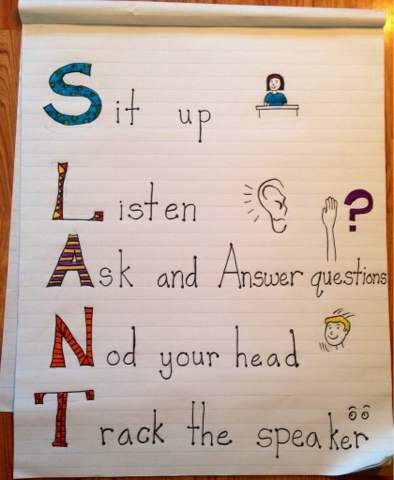 This is a SLANT anchor chart designed to help students with active listening. Teachers ask students to "pay attention" all the time. However, many students don't know what that means. This anchor chart is great because it encourages students to be actively involved in listening, rather than sitting back and passively listening to a speaker and not showing them that you are following along. Also, the anchor chart provides great social cues for students with special needs. The next time you ask your students to pay attention, don't forget about SLANT!